If redwood trees could share their stories, what would they say? Some of these giants are thousands of years old, but all have witnessed some truly unique moments in history. 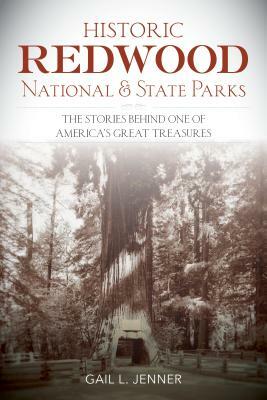 Historic Redwood National and State Parks is a vibrant collection of essays sharing different parts of Redwood National Park's history, from the Native Americans and the early explorers to park visitors today. Celebrate the 100th anniversary of the National Park Service and learn more about the cultural, political, and natural history of Redwood National and State Parks. Gail L. Fiorini-Jenner has completed two historical novels and four nonfiction titles on regional history, including three books on the mythical State of Jefferson. Her first novel won a WILLA Literary Award from Women Writing the West. She edited and contributed to an anthology, ANKLE HIGH AND KNEE DEEP: Women Reflect on Western Rural Life, released in 2014, that reached Amazon's Top 100 books on country living in its first 30 days. She writes monthly for a regional publication and has sold numerous articles, children's stories, and women's stories to a variety of publishers and publications. She has appeared on History Channel's "How the States Got Their Shapes," as well as on "Mysteries at the Museum" and "Legends and Lies." She also appeared on "Oregon Experience: The State of Jefferson" on Oregon PBS (which won a Spur Award) and writes for Jefferson Public Radio's historical "As It Was" series. Gail is a member of Women Writing the West, Western Writers of America, Rogue Writers Ink, as well as her local historical society and CattleWomen's Association. As a retired history and English teacher, she volunteers at her local museums and library. She is the wife of a fourth generation cattle rancher, which contributes to an active, outdoor lifestyle that adds to her love of local and regional history.